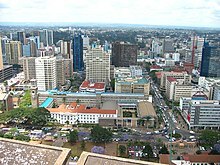 -1.286388888888936.8172222222221 Nairobi — the cosmopolitan capital city and economic centre of Kenya and most vibrant in the East African region. -4.0539.6666666666672 Mombasa — historic port on the Indian Ocean seafront and probably Africa's longest continuously settled town. -0.134.753 Kisumu — the major city to the west, on the shore of Lake Victoria. -2.268611111111140.9002777777784 Lamu — main town of the Lamu Archipelago, renown internationally for its annual cultural festival. Most car rental companies offer cars of all sizes with Japanese models being dominant. All reservations can be made in English with some rental companies providing reservations in French, German, Chinese and Spanish. International car rental companies such as Europcar, Sixt, Budget, Avis and Hertz offer car rental in Kenya. Local car rental companies like Hire N' Drive, Elite Car Rental Kenya, Offroad Car Hire, and Davina Cabs [dead link] are usually very competitive and professional. WARNING: Due to risks of kidnapping, cross-border violence, and banditry, both New Zealand and Canada advise against travelling near the borders between Kenya and Ethiopia, Somalia, or South Sudan. If you're planning to travel to Kenya during Ramadan, consider reading Travelling during Ramadan. This country travel guide to Kenya is a usable article. It has information about the country and for getting in, as well as links to several destinations. An adventurous person could use this article, but please feel free to improve it by editing the page. This travel guide page was last edited at 18:05, on 26 March 2019 by Wikivoyage user Ibaman. Based on work by Wikivoyage users Mx. Granger, Broccolihaar, Traveler100bot, Ground Zero, SelfieCity, DocWoKav and The dog2, Wikivoyage anonymous users 181.224.248.206 and 154.126.39.63 and others.